ALL SPRUCED UP. 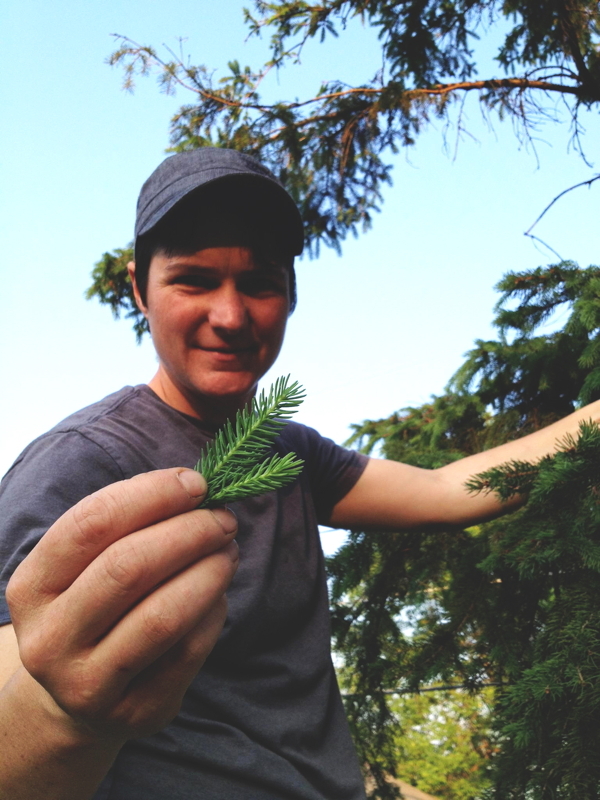 Thirsty Pagan head brewer Alyson Rolph finds some spruce tips to add a unique, distinct flavor. Currently in the midst of a hectic second year as head brewer at Thirsty Pagan, Allyson Rolph took the time to sit down and talk beer with the Volume One staff. Located in Superior, the restaurant/brewery boasts a wide variety of IPAs, domestics, and some of their very own creations. We’re interested in hearing about the Thirsty Pagan’s brewing process. Run me through some of your daily duties as head brewer. Well, it really depends on the size of the brewery that they’re at. For me, I do pretty much everything with the assistance of two assistant brewers. So it’s everything from recipe formulation and actual brewing of the beer to cleaning kegs, cleaning serving tanks, cleaning lines. And since we’re a brew pub, we take care of everything in our own house. How many different beers does the Thirsty Pagan make itself? Right now, we have seven full-time house beers and the ability to have up to 15 different beers on tap. We do keep a cider from the Whitewater Winery pretty much all the time because it gives us a really nice, gluten-free cider option. … We have two brewing systems now, one is a small, two-barrel system and that’s what we’ve been using for everything up until January of this year. We then invested in the brewery and the business and got a used, seven-barrel system with four fermenters. Of the beers you are creating now, which is your favorite and why? We are doing a series of beers where we explore other plants and herbs that have been used for bittering other than hops. We just call it our “Not-Just-Hops” Series. So we did a couple spruce-tip beers, we did a white spruce-tip IPA earlier this summer and I really enjoyed doing that beer. So it had this really bright citrus, pine thing that was from both the hops and pine that was in it. It made a really interesting IPA. – Alyson Rolph, on brewingWhat made you initially interested enough to make being a head brewer into a career? What would your career be if brewing was never in the picture? Well, I was managing an art gallery. You know, I really don’t know. My next step would probably have been getting a job in the brewing industry. Becoming a head brewer at the place where you like to drink beer and hang out, and it was my favorite place to be anyway, it’s just a lot of fun to brew the beer at my favorite bar. Is there one specific part of the process that you enjoy the most? I really like when we mash in, when we first add the grain and the water together in the morning. You just get this really great toasted bread smell. I really like mashing in and getting the aroma of all the grain first thing in the morning. It’s fantastic. Any advice you would give to people interested in becoming a brewer in the Midwest? Pretty much any advice people will give you is learn as much as you possibly can, whether it be reading books or learning to home brew. Volunteer anywhere that will let you in. Learn about beer styles, the industry. Basically, just learn as much as you possibly can and then find out if you really like cleaning things because that’s what we do a lot. Being a female head brewer, do you see yourself as a role model to others? It’s a question I get a lot being a female brewer in a really male-dominated industry. I think there is no real reason that a woman can’t be a brewer. As long as she can carry a 50-lb. sack of grain and you know about beer and you really take care in cleaning and all those other things. If I’m a role model, that’s fantastic.